Firefox 11 is available for Download, Mozilla announced, the popular browser brings new features for both general public as well as for developers. The features include Add-on sync, Chrome data migration, CSS Style editor, a visual layout tool 3D view named Tilt. Firefox 11 brings the Chrome migration tool that allows you to migrate your bookmarks, history, and cookies from Google Chrome. Thatâ€™s all for now, Passwords and form data will come in later releases. Another feature is that Firefox now allows to sync add-ons across multiple desktops. Chrome has this feature from quite some time. You can access sync from the options sync tab, and toggle add-ons sync. You need to setup sync account if you donâ€™t have one already. Firefox 11 comes withÂ Style Editor tool that allows developers to edit the CSS of web pages on the fly and see the changes. Style editor css tool allows to edit both inline and external stylesheets and after editing users can save the updated stylesheet to the system. The style editor has two pane view and syntax highlighting. It can be accessed from the We Developer Menu in Firefox. â€œTilt 3D view stacks elements as they are nested in the DOM and lets you see elements that are hidden or off the page.â€ This 3D visualization of the Web DOM is powered by WebGL. WebGL is an open standard for running Web Apps in the browser with hardware accelerated 3D graphics with out any third party software. 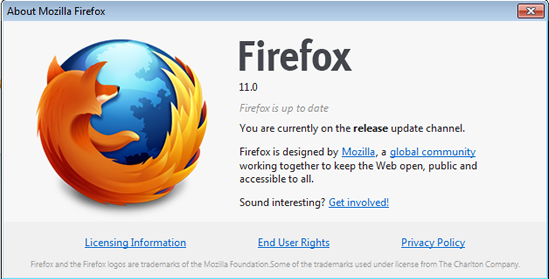 Firefox 11 is available for download from Mozilla website. It will be pushed to the users with automated update feature. You can go to Firefox Menu > Help > About Firefox to get the update immediately. Firefox 11 release notes.